Born in Birmingham, schooled in Hull and studied in Leeds where he later taught at the College of Art before becoming an independent artist and now living and working in London. His early work was always playful, setting words against images, exploring visual oxymorons and paradoxes. 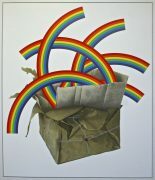 His fascination with the illusion of perspective led to his signature series of paintings and prints using a rainbow motif, treating the rainbow as a solid rather than transitory experience and endowing it with personality.